1. 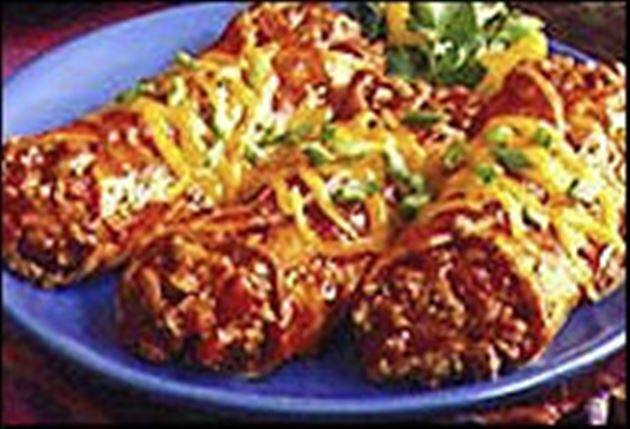 In a 1-quart microwave-safe baking dish, combine enchilada seasonings, tomato paste and water; mix well. Heat, uncovered, on HIGH for 5 minutes. In a separate microwave-safe dish, cook turkey, covered, on HIGH for 5 minutes; breaking up beef and rotating dish halfway through cooking time. Drain. 2. Stir in beans and tomato. Pour 1 cup of enchilada sauce into a 13x9x2-inch microwave-safe baking dish. Dip one tortilla into remaining enchilada sauce; drain excess sauce from tortilla. Spoon about 1/4 cup of turkey mixture down center of tortilla; roll and place scam down in baking dish. Repeat with remaining tortillas. 3. Spoon remaining enchilada sauce over enchiladas; cover with cheese. Cook, covered, on HIGH 6 minutes and uncovered, on HIGH 4 minutes more or until heated thoroughly and cheese is melted. Rotate dish once during cooking time. Sprinkle with green onion. Enjoy this delicious enchiladas Mexican recipe!